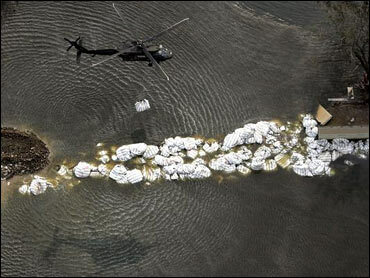 A contrite U.S. Army Corps of Engineers took responsibility Thursday for the flooding of New Orleans by Hurricane Katrina and said the levees failed because they were built in a disjointed fashion using outdated data. "This is the first time that the Corps has had to stand up and say, `We've had a catastrophic failure,"' Lt. Gen. Carl Strock, the Corps chief, said as the agency issued a 6,000-page-plus report on the disaster on Day 1 of the new hurricane season. The Corps said it will use the lessons it has learned to build better flood defenses. "Words alone will not restore trust in the Corps," Strock said, adding that the Corps is committed "to fulfilling our important responsibilities." The $19.7 million report includes details on the engineering and design failures that allowed the storm surge to overwhelm New Orleans' levees and floodwalls Aug. 29. Many of the findings and details on floodwall design, storm modeling and soil types have been released in pieces in recent months as the Corps sought to show it was being open about what went wrong. But the final report goes into greater depth. The Corps, Strock said, has undergone a period of intense introspection and is "deeply saddened and enormously troubled by the suffering of so many." Katrina damaged 169 miles of the 350-mile hurricane system that protects New Orleans and was blamed for more than 1,570 deaths in Louisiana alone. Robert Bea, a University of California at Berkeley engineer and Corps critic, called Strock's comments and the report signs of "a leadership in growth." "They're catching up with the 1,000 years of progress of the Dutch," Bea said, referring to the Netherlands' long, and mostly successful, history of battling the North Sea. The much-anticipated report, prepared by the 150-member Interagency Performance Evaluation Task Force, assembled and headed by the Corps, is intended to serve as a road map for engineers as they seek to design and build better levees and floodwalls. Meanwhile, mobile phone companies are working on bolstering their systems to try to prevent a repeat of the havoc Katrina caused last year to its systems. A Verizon Communications spokesman said "communications is key for relief organizations, law enforcement and to help customers keep in touch" with their families. And Cellular South said it's investing more than $8 million in equipment and system upgrades to circumvent potential damage to landlines. A top executive says the company is investing an additional $78 million to add new cell sites to its network across Mississippi. Serious work began on New Orleans' hurricane protection system in the 1960s after Hurricane Betsy flooded the city in 1965. But over the decades, funding slackened and many parts of the system were not finished by the time Katrina hit. The result was a disjointed system of levees, inconsistent in quality, materials and design, that left gaps exploited by the storm, the report said. Also, engineers did not take into account the poor soil quality underneath New Orleans, the report said, and failed to account for the sinking of land, which caused some sections to be as much as 2 feet lower than other parts. Four breaches in canals that run through New Orleans were caused by foundation failures that were "not considered in the original design of these structures," the report said. Those breaches caused two-thirds of the city's flooding. Thursday's report urged the Corps to shift its formulaic cost-benefit approach on how it decides what projects are worthwhile. The agency was urged to look at potential environmental, societal and cultural losses, "without reducing everything to one measure such as dollars." The report did not directly address questions raised in other studies regarding the Corps' organizational mindset. Last month, a report by outside engineers said the Corps was dysfunctional and unreliable. That group, led by experts from the University of California at Berkeley, recommended setting up an agency to oversee the Corps' projects nationwide. While the Corps reported on New Orleans'past, Mayor Ray Nagin looked toward its future as he took the oath of office Thursday for a second term leading this storm-hobbled city, promising a better future during a ceremony held at the site of some of the worst misery caused by Katrina. "How can we do an inauguration on the same day as hurricane season? Lord, have mercy," Nagin joked in a speech that often sounded like a sermon as he recounted small miracles in the city and promised bigger ones to come. In response to criticism after Katrina, the Corps has made fixing New Orleans' flood protection system a top priority and tried to incorporate the task force findings. The Corps already has spent about $800 million for repairs and improvements and plans to spend $3.7 billion over the next four years to raise and strengthen levees, increase pumping capacity and install more flood gates. A thorough assessment of the region's current flood defenses found no "glaring weaknesses," said Col. Richard Wagenaar, the Corps' district chief in New Orleans. The Atlantic hurricane season runs through Nov. 30. William Gray, a leading hurricane forecaster, said Wednesday that the 2006 season should not be as destructive as 2005, which set records with 28 named storms and four major hurricanes hitting land. Gray's team is forecasting 17 named storms this year, nine of them hurricanes.